Dimensions 0.89 by 6 by 9 in. High above the windswept plains of Kazakhstan, three astronauts on board a Russian Soyuz capsule begin their reentry. A strange shimmer in the atmosphere, a blinding flash of light, and the capsule vanishes in a blink as though it never existed. On the ground, evidence points to a catastrophic failure, but a communications facility halfway around the world picks up a transmission that could be one of the astronauts. Tragedy averted, or merely delayed? A classified government project on the cutting edge of particle physics holds the clues, and with lives on the line, there is little time to waste. Daniel Rice is a government science investigator. Marie Kendrick is a NASA operations analyst. Together, they must track down the cause of the most bizarre event in the history of human spaceflight. They draw on scientific strengths as they plunge into the strange world of quantum physics, with impacts not only to the missing astronauts, but to the entire human race. 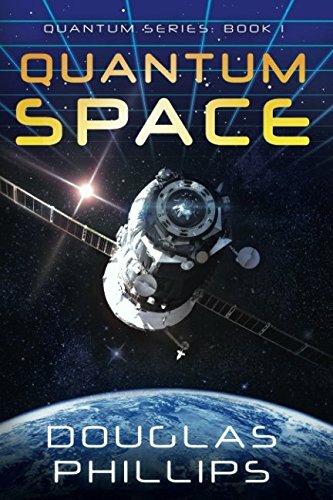 If you liked the authenticity of The Martian, the page-turning pace of Da Vinci Code, and the inspirational world view of Arthur C. Clarke, you'll love Quantum Space. A mind-bending journey from the ultra-small to the vast stage of the Milky Way. "Quantum Space is well-crafted, fast-paced, edge-of-your-seat entertaining!" - Robin Praytor, author of the Dark Landing series.